As a content marketer, you’re always pushing out content you hope visitors will find and love. And you’re always trying to get visitors to convert into customers. Those are your two jobs – producing content and converting visitors. But are your efforts paying off? And, if they are, how do you know what’s working and what’s not? How do you optimize your content marketing? Thankfully, Kissmetrics is here to help. I’ve detailed five reports every content marketer can use to refine and optimize their content marketing. The measuring and reporting tools outlined below will help you get focused on the work that will produce the best results. You’re a marketer and you have numbers you need to meet every day, week, month, quarter, etc. Maybe the goal is to increase email signups by 2x, drive more people to a “Send Me Info” form, sign up people for your product, deliver orders (for ecommerce companies), get people to leave comments on a blog post, or drive people to a landing page. Whatever it is, you need to start by seeing how many people are already moving toward that goal. Where am I trying to drive my users? What would make my boss happy? Would it be acquiring customers, increasing email signup rates, or bringing more leads to our sales team? Figure out what this is (or “these are,” as you can certainly work toward increasing more than one number). Who knows, maybe you want to see how many people are commenting on your blog posts. If you want to move that needle (or are just curious), that’s cool. I won’t judge. Then you can use the Kissmetrics Funnel Report to see your baseline, and use A/B tests to move the needle (more on that later). You can break out each group and see how well it moves through your funnel. The best groups should get more of your attention and money, while the worst groups should be toned down. Blog Category – If you run a blog, you can use blog category to track which category drives the most signups. 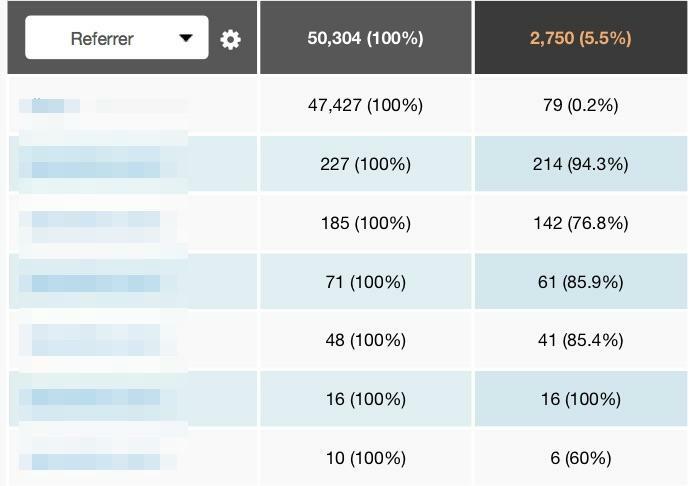 We do this for our own blog and know which blog categories are the most effective at driving signups for the Kissmetrics product. This helps drive our content strategy because we know which content attracts the right audience. Note that “blog category” is not automatically tracked in Kissmetrics. You’ll need a little help from a developer. Once you implement it, you’ll find the information is helpful. Type of Content – Content marketing is more than just text-based content. Maybe you have videos, audio files, infographics, etc. You can track each of these content types and see how people who view them move through your funnel. This will help you answer questions like “We’re spending all this time and money on infographics, but are we actually getting customers from them?” or “We have tons of videos, but do people who view the videos go on to sign up for our product?” Again, “type of content” is not automatically tracked in Kissmetrics. Just get a little bit of time from a developer, and they’ll set you up. The blurred column on the left is a list of the exact URLs that sent traffic and signups. This is especially useful with guest blogging. If you guest blog and link back to your marketing site in the byline, you will be able to see how many people visit and how many of them sign up. If you have an affiliate program, you can track traffic from each affiliate and see how it moves down your funnel. Okay, so you get the idea about the Funnel Report. You can see where you’re losing customers through website flow, you can segment group traffic by whatever will get you the best insights, and you can optimize your marketing. On top of all that, you can put a smile on both your face and your boss’s face when that needle moves in the right direction. Click here to watch a demo video of the Funnel Report. Now, how do we move the needle? Through tests and iteration, of course. Let’s get into that now. You want to get more people to sign up (or reach whatever goal you have). The best way to do this is to A/B test. Since you’re a marketer, you’re probably running tests galore. You also probably use Optimizely, VWO, Unbounce, or some other testing tool. You can test any part of your funnel. This is especially useful if you have a long onboarding process. Let’s say you run a SaaS company and your blog gets a lot of traffic. You can run a test on your blog to see how it impacts product use, not just to see how many signed up for your product. After all, what good is a signup if they don’t use your product? We’ve run plenty of internal tests at Kissmetrics on variants that appeared to be winners at the top of the funnel, but as we went further on down the funnel, they were losers. If we weren’t using the A/B Test Report, we would have launched a losing variant! The A/B Test Report will display the statistical significance of your test. This is really important, as too many marketers (hopefully you’re not one of them) cut their test way too short. They’ll bring it live on Monday and close the test the following Wednesday, well before enough data has come in. (You can think about statistical significance this way [if you’re not a sports fan, skip this part]: Baseball, hockey, and football player stats in the first few games don’t really matter. Stay with me here: When the 2016-2017 baseball season starts, no one is going to put too much stock in a player’s first few games. Why? Well, if they go 3 for 4 in their first game, their batting percentage is going to be 750%. Obviously, it’s going to come back down to earth shortly. And no one looks at what a player did in the first game – watch the TV broadcast and notice they show the stats on how the player batted the previous year. There’s more data there. The same is true for your test.) You need to allow enough data to come in before you can reach conclusions. And since you’re using the Kissmetrics A/B Test Report, you’ll quickly know the statistical significance. If you don’t pay attention to this, you may launch a losing variant before enough data has come in. The A/B Test Report will give you a recommendation. Was the original page the winner with statistical significance? If so, it will tell you to keep that. Or was it the variant? Or was it a toss-up? You’ll know with the A/B Test Report. No more guessing. You will see every person who was in the test. And you won’t see just the number of people, but who the people actually were. You can dig deeper and see where they came from, if they converted to a paying customer, etc. At the very top, you select a baseline. Below that, in bright blue, is the recommendation. On the next line, those 5 numbers in bold are the metrics for the test: how long it ran, how many people were in it, how many conversions there were, the improvement, and the certainty of improvement (aka statistical significance). You’ll want to go for at least 95% certainty. The middle of the report is the data visualization. You can see the variant was the big winner here and that it was during the entire time the test was running. The bottom section contains the metrics for each variant. You see the number of people in each variant (click the number to see a list of every person), the number of conversions for each (click the number to see each person who converted in the specified variant), the conversion rate, the improvement, and the certainty. This depends on which needle you want to drive. Since you’re a marketer, I’m assuming you’re in charge of increasing signup rates. Your boss tells you “If you double signups by the end of the year, you get a bonus.” You accept the challenge (why wouldn’t you?). Awesome, now start testing. You’ll run the test on your blog. It’ll include a small CTA that shows up at the end of blog posts. Talk to a designer, get something sketched up, bring in a developer to get the variant page running, and create your test in Optimizely, VWO, Unbounce, etc. (we integrate with them all), and track the results in the A/B Test Report. 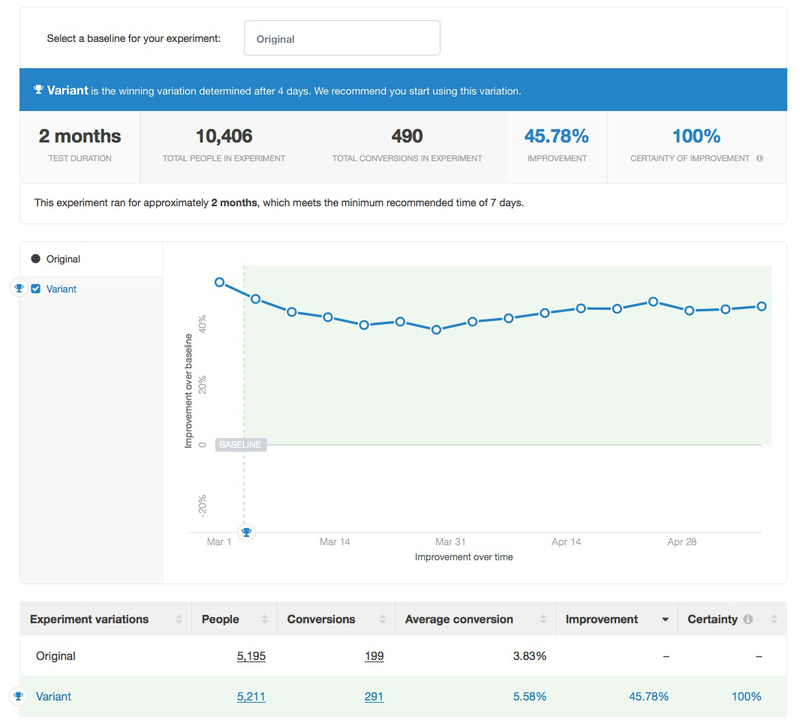 Again (and this is important), you can test any part of your funnel with the A/B Test Report. So more people click on the CTA in your variant page. Great? But did they actually start using your product? You’ll know with the A/B Test Report. Landing Pages – If you have landing pages for webinars or eBooks, you can test various elements on these pages. Try removing fields or adding/removing steps, and see how it affects your conversion rate. CTAs, Button Copy – What content site doesn’t have a few CTAs and signup forms on every page (besides Zen Habits)? As a marketer, you know you need to test and optimize everything you can get your hands on. Test your headlines and your button copy. See that orange “Try Kissmetrics” at the top of this page? We’ve gone through dozens of copy for that button. “Try Kissmetrics” is what has performed best. If the button copy isn’t “Try Kissmetrics,” that means we’ve found another winner that beat it. We’re always testing. It’s a good idea to A/B test these tools on your website to see if they actually move the needle. The general rule of thumb is this: anything the visitor can see should be tested. The visitor can see a lot of things (CTA, headlines, optimization tools, elements on landing pages, etc. ), and you should test them all. Click here to watch a demo of the A/B Test Report. Building loyalty is difficult. This rule goes for almost anything, but especially for building a loyal audience on the web. There is an unlimited number of websites, but visitors are able to keep only a small number of sites in their rotation. For most people, that might include Facebook, their favorite news site, YouTube, and a few others. So it’s very difficult to get into that daily rotation. The best you can hope for is to have people sign up for your email newsletter and/or subscribe to your RSS feed. Now, how do you track reader loyalty? A cohort is a group of people who share a common experience or characteristic within a defined period of time. For marketers, this could be a group of people who signed up for your product in May. It could be called the “May Signup Cohort.” People who visited your blog and commented may be a cohort you pay attention to. On the left-hand side, we see the list of marketing channels. People who first visited the blog during our date range (May 1, 2013 – May 31, 2014) are put in one of these buckets, depending on the channel. In the next column, we see the total number of people in each channel who visited the blog during those months. On the right, the blue shaded cells with percentages in them show us when the people visited the blog. So if a person came to the blog from a Google search in May 2013, they would be put in the organic bucket (20%). If they visited the blog again in July, they would be put in column 3 across from organic. The higher the percentages (darker shades of blue), the more retention there is. Since you’re a content marketer and you want to drive retention, you’ll want to get more traffic from the marketing channels that have proven to deliver strong reader retention. This example shows us that email brings strong reader retention. The main takeaway for us is that we need to continue to drive people to our email newsletter. Once we do that, we will have a strong possibility of keeping them as readers. So our new goal is to build up our email list. Track which types of content bring in loyal readers. Are certain pieces of content keeping people from returning? Track signup rates across marketing channels or types of content. Perhaps one type of content leads more people to sign up. 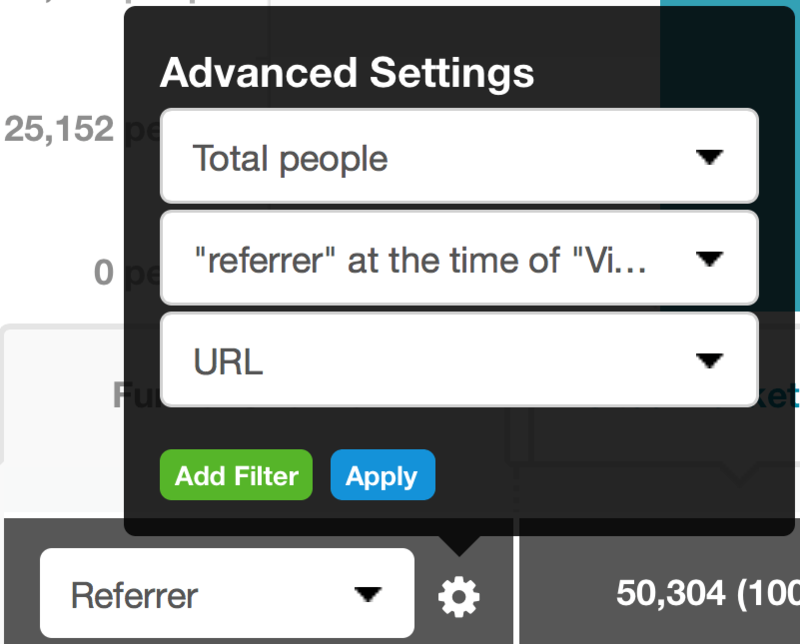 If you guest blog on other platforms, you can track referrers and see which bring loyal readers, or even signups. Yes, you can. But the Cohort Report allows you to track signups over time. So if someone comes to your site in March but doesn’t sign up until November, the Funnel Report may not report that if you don’t extend your date range long enough. Another benefit of using the Cohort Report to track signups is that you can see how long it takes people to sign up after they visit your site. Did you have a marketing campaign in April that didn’t get many signups? Perhaps people who visited in April weren’t ready but came back 8 months later and signed up. You’ll see this with the Cohort Report. 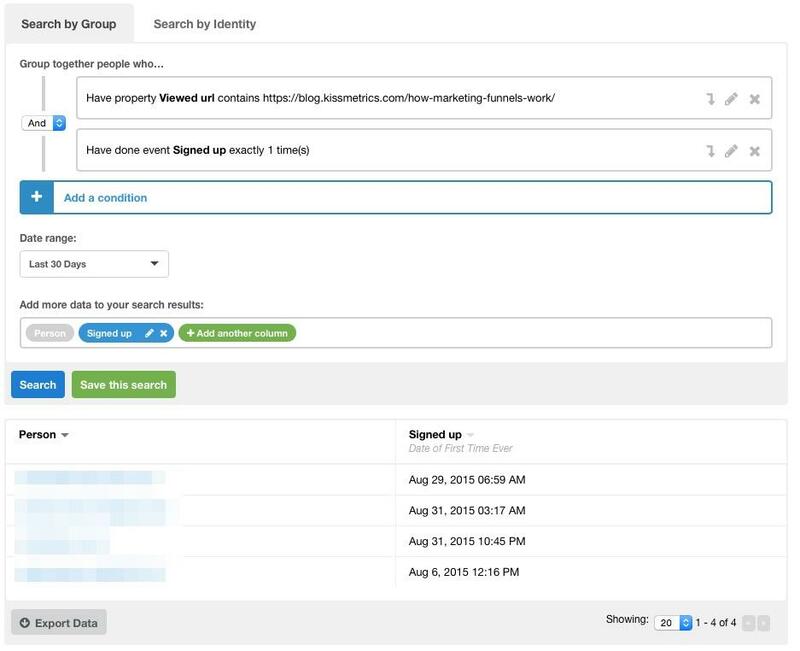 You’ll be able to tie marketing campaigns to signups. We’ve written a lot about this before. Check it out if you would like more information. You can also watch a video demo of the Kissmetrics Cohort Report. A big benefit of using an advanced analytics platform like Kissmetrics is that it tracks people. Every action on your site gets tied to a person – THE person who performed the action. This opens a world of possibilities, one of them being the ability to tie content to business growth. Let’s break it down. 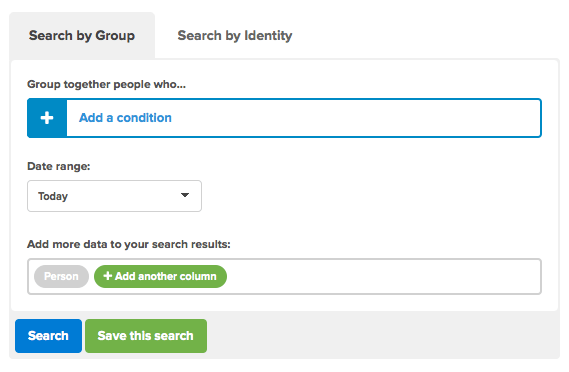 If you want to see whether a specific piece of content brought in signups/leads/customers/whatever you track, use the People Search feature. If you want to see pieces of content lined up next to each other and see which leads to signups, use the Funnel Report. In the first option, you have a piece of content on your website, be it a blog post, video, audio page, etc. You want to know if people who viewed that page eventually went on to sign up, submit a lead form, etc. Here’s how you do it. Here is the starting page in People Search. In simple terms, you can find people based on things they have done on your site. We’ll use a blog post url and select “Sign up” as the event. This means that people will have to have viewed the url and signed up. If they viewed the url but didn’t sign up, they will not be in this list. The same goes for if they signed up but did not view the url. They have to have done both to be in this list. A quick note: This is not in chronological order. A person does not need to view the url and then sign up. They can sign up and then view the url. They just have to have done both within the selected date range. We’ll select the date range as the last 30 days. This means that people must have viewed the url and signed up within the last 30 days. We’ll also find out when each person signed up. The final step is to click Search. The blurred out column on the left is a list of email addresses. This is how we choose to identify people. You can use anything you like, but email address is usually best. So we see that over the last 30 days, 4 signups have viewed that specific url. You can do this with any url on your site. Just set your criteria, and you’ll get your data. You’ll learn which content turns visitors into readers. Maybe a post got a lot of traffic but actually zero signups, while a less-visited post actually converted a lot of people. Take what you learn from this data and tailor your content accordingly. If you have a gardening site and see that content about perennials doesn’t convert people to purchase but content about apple trees does, then you can tailor more of your content toward apple trees. Again, you don’t have to use signups. Just use whatever goals you have or what needle you want to move. This is great data, but don’t draw conclusions too quickly. Keep in mind that a person may view a dozen pages before signing up. Just because they viewed a page and signed up doesn’t mean it was that page or piece of content that led them to sign up. You’ll have to get a little more granular if you want to see the exact path they took. Fortunately, you don’t have to leave Kissmetrics to get the data. It’s all within the Kissmetrics Person Details report. Click here to watch a People Search demo. If you want to get a more broad view of the relationship between content and revenue, you can use the Kissmetrics Revenue Report. Which blog post categories acquire the most customers? Which type of content brings the most customers? Which content brings the most valuable customers? If you’re asking these questions, then the Kissmetrics Revenue Report is your new favorite tool. This report gives you an overview of your revenue. You’ll get a graphical representation of your revenue. Also, you’ll be able to break up your revenue into segments (groups) to see which group is performing the best. Because, taken as a whole, your revenue is just a number. It’s great by itself, but it really doesn’t give you the information you need to bring more revenue to your company. You can break up sources of revenue into groups. For instance, you can look at the customers who came from each marketing campaign and see which campaign brought the most valuable customers. When you do this, you’ll have a much better understanding of what you need to do. This is exactly why it’s called actionable data. And it’s exactly the type of data you get in Kissmetrics. Enough talk, time to see the Revenue Report in action. I’m not going to bore you with every step of setting up a report. We’ve already been through that. Let’s say we have an ecommerce store selling auto parts. Throughout our site, we have content on car repair and maintenance – everything from changing oil to replacing transmission gaskets. We love producing the content, but we also need to make sales. We want to know which type of content brings us the best customers, so we use the Kissmetrics Revenue Report. We’re sorting by total revenue. We can see that the most revenue comes from customers who viewed articles about transmission repair. There are a few other important metrics. I particularly like lifetime value. This tells us the total amount of revenue we can expect from each customer. As we can see, customers with the highest lifetime value viewed articles on transmission repair. Our largest number of paying customers also came from this post category. What about our old friend, churn? For our ecommerce company, we need return customers. Businesses aren’t built with one-off customers. We need to keep churn as low as possible. With the Revenue Report, you can trigger churn as an event or if a customer doesn’t pay you within x number of days. In this case, churn is pretty high, and there isn’t much variation among post categories. This looks like a larger company-wide issue. Also, we may need to expand our churn time frame. Some car parts and materials are consumable – people will always need to buy quarts of oil, filters, wiper blades, etc. Other products are bought only once. This makes churn a little more difficult to nail down. Customers will repurchase some items, but not others. Keep producing content on transmission repair. These articles bring us a lot of customers with a high lifetime value. Maintenance and body repair are also strong post categories. After that, there is a drop-off. So we’ll focus on writing and expanding our library of transmission repair, maintenance, and body repair content. See how types of content correlate with revenue. You can also do this with different subjects. Look to see if customers came from a PDF, a webinar, a blog post, etc. This will help you narrow down what’s working so you can put more energy into those things. If you’re doing a lot of guest blogging, you can check out referrer or channel to see if your efforts are actually bringing enough valuable customers. Click here to watch a quick demo video of the Revenue Report. Marketing is all about measuring and optimizing, and these five Kissmetrics reports will help take your content marketing to the next level. And you aren’t limited to just these five reports. Every business is different, and you have goals you need to meet and exceed. Kissmetrics is a versatile product. 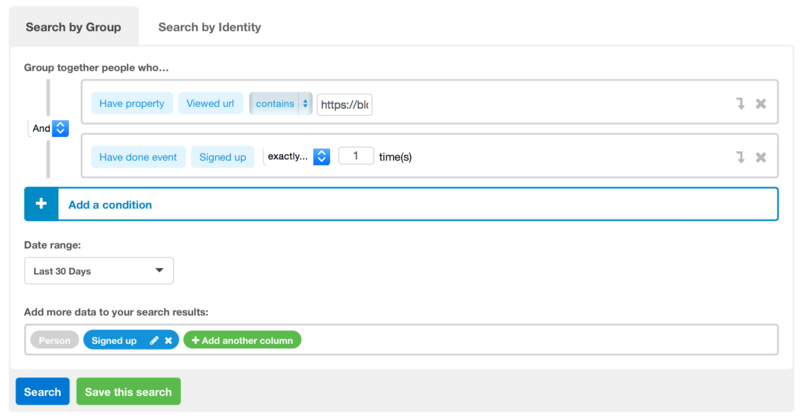 You can track any action a person takes on your site. It could be clicking a button, submitting an order, downloading a file, etc. Track everything or only a few things. It’s up to you. Kissmetrics is here to give you the data you need to optimize your growth. Now, finally, I’ve got one more tool up my sleeve. This tool will help you boost conversions towards whatever needle you’re looking to move. Let me tell you a little bit about it. Increase blog newsletter list – Do you have an email list of subscribers who receive updates and new content you produce? Create an engagement on your site that points visitors to the email signup landing page. Move visitors toward content – You know what type of content converts. Now you just need to move people to that content. Use Engage to point people in the right direction. Drive traffic to landing pages – Gated content is one of the best ways to drive leads. 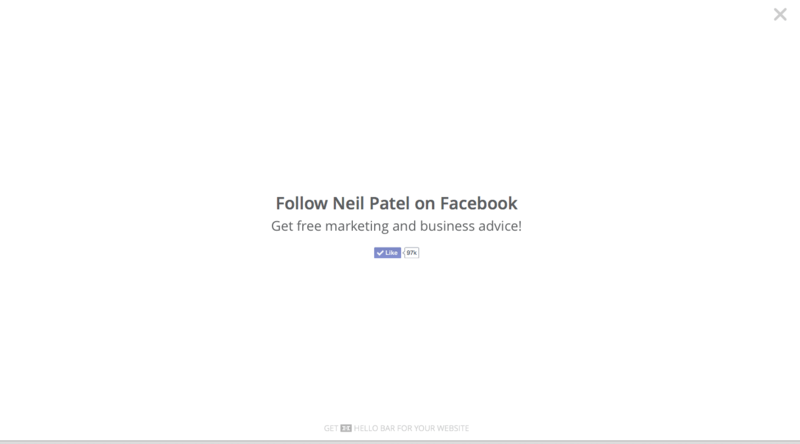 The more people you can get to your landing page, the more leads you’ll have. Introduce people to your service – Content marketing isn’t really marketing if you’re not bringing in any customers. Show people what you really do (besides blogging). Create an engagement that sends them back to your main website. The more visitors you can turn into prospects, the better. With Engage, you’ll have a great tool that can optimize conversions and turn visitors into customers. Use it wisely. 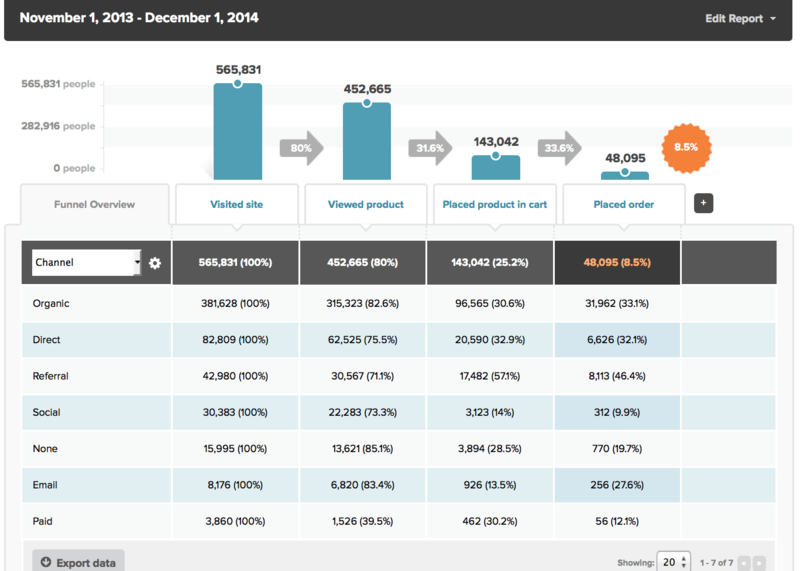 The Funnel Report allows you to see where visitors are dropping off in a conversion funnel. Track whatever needle you need to move, whether it’s signups, downloading a white paper, submitting a landing page, etc. Find out which types of content and which referrers are delivering the most customers. See if guest blogging is working for you by observing whether people who viewed a guest post of yours visited your site and signed up for your service. The A/B Test Report allows you to test any part of your funnel. Create your test in Optimizely, VWO, Unbounce, etc., and track the results with the A/B Test Report. Test your landing pages and CTAs to see if any optimization tools actually do you any good. Track reader retention with the Cohort Report. See which types of content bring people back and even which marketing channels bring loyal readers. See which content converts with the People Search. Pick a piece of content and see if it has brought you signups. No longer do you have to guess – you can see which content converts. Get a bird’s-eye view with the Revenue Report. See which types of content bring you the most valuable customers. Track total revenue, average revenue per customer, lifetime value, total number of paying customers, and churn rate. Nudge visitors toward conversion with our Engage tool. Create lightboxes that move people to sign up for blog updates and gated content or that send people back to your main website. These are just a few examples of what content marketers can do with Kissmetrics. Our reports are more than vanity metrics – they provide insights into how users are behaving on your site. Once you see this data, you’ll know what needs to be improved. Ready to get straight into the action? Just click the button below to request a personal demo of Kissmetrics. You’ll learn more about Kissmetrics and how it will help you optimize your marketing.